Three brand new sets have just been released in the HMAF Character Building range. The HM Armed Forces Tri-Service Team Sets are fully compatible with other toys in the range and all three sets include an exclusive HMAF Character Building figure. The Royal Navy 30MM Gun Crew Set includes a Royal Navy Deck Gunner micro-figure. 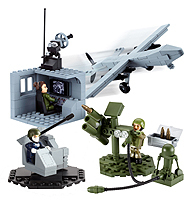 The Army Air Defence Launcher comes with a Royal Artillery Soldier micro-figure. And, the RAF Reaper Aircraft and Remote Operator Set includes a female HMAF Remote Operator figure. Character’s Armed Forces Tri-Service Team Sets, as previewed at the January Toy Fair, were released in the UK in July 2012.